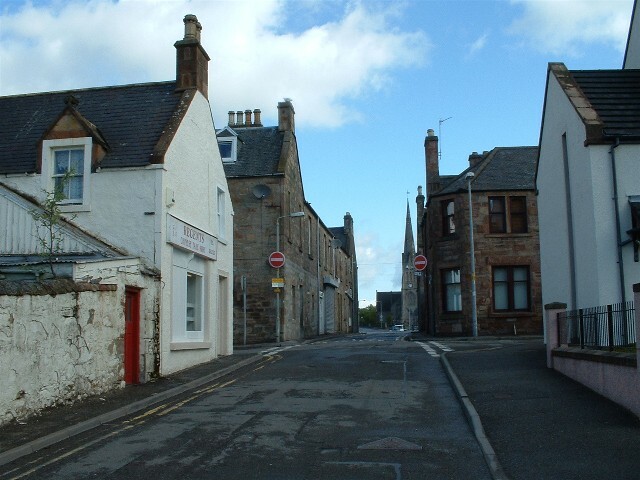 The northern end of King Street with the crossroads with Clyde Street in the foreground. Beyond that row of buildings on the left is the crossroads with the High Street. See picture #896 for another view of King Street. I guess 9 o'clock on a Saturday morning is a bit early for many people, Bill, but this part of town doesn't see much traffic as there is no direct access from King Street onto the Shore Road and the port area. My goodness! No sign of Jock the Barbers shop, no butcher in the left foreground and no sign of Slaters on the right. Are all the only shops on the High Street now? No cars Malcolm, did you take this at 5a.m.? Douglas, Ross the dentist moved from Jock the Barber's a long time ago and moved out on the Saltburn road to Admiralty Terrace where he was equally as painful; remember him being cheap with the freezing...had 4 teeth pulled (didn't believe in saving them back then) and by the time he got to the last 2 the freezing had gone, he broke the teeth leaving roots in, had to go to medical Dr. to have them removed. Shop which used to be Grants butchers is now a Chinese take-away - I was message boy there for a short time. Jock the barbers behind No Entry sign on left is now empty; next up is a Chippy - only shops on that side now. Yes Harry, would be nice to see King Street back to cobbles again. When was Jock the Barber�s shop changed? I don't suppose Ross the Dentists are still in the building, above where the barber�s shop entrance was on Clyde Street? Many a painful time in their chairs (it was a husband and wife set-up). What is the shop on the bottom corner of King St? - it used to be a butcher�s shop but cannot read the new sign. Anne, I often wondered the same, they would rather pull them than fill them. It was the same with tonsils, it seems you just have to have them out also. The toffee I remember was Highland with a Highland Coo on the front; they were great. On reading Harry's and Billy's comment on extracting teeth, I wonder why we all had teeth out at such an early age? It wasn't because we ate too many sweeties!! Looking back the only sweeties I can remember were the bars of McEwans toffee. My treat on a Sunday was to go to Jock the Barbers, hand over the coupons and 3d for a bar of toffee. Happy days!!! I will never forget the first tooth I ever had out. My Auntie Retta (Amelia Muckle's mother) took me to Ross the dentist at Jock the Barber's shop. I can't remember having an injection but I will never forget the pain and the amount of blood I lost.......I am sure it is not my imagination but the blood dripped all the way down to the end of Clyde Street to the house where my Grandma lived. I have been scared of dentists ever since!!!!! Oh Please! Even after all these years the memories of the dentist sends shivers down my back. Does anyone remember the visiting school dentist? A big green van which carried a smell of ether which terrified me.The dentist was a small balding man who had no caring skills for small children. His drill was foot operated and the pulled teeth were dropped into a fire bucket of sand so that bloodied teeth were the first thing you saw on entering his chamber of doom! I can hear the screech of that drill now! "Kyle & Cochrane" would be an ideal title for the next Ken Loach movie--A tale of blood curdling skulduggery in rural Scotland. Given his previous performances perhaps Dustin Hoffman would take a lead role? I think the school dentist's name was Mr Cochrane, assisted when necessary by Nurse Kyle. Fillings may have been alright in the morning, but by afternoon his little legs drove the drill very slowly! Well Billy, you were lucky..mine were torn out at the Hospital in Dingwall, along with plenty of others my age..so many in fact that there was 2 to a bed - one at the head and one at the foot. God help you if you got any blood on the bed..the nurses would have to change them before the Matron or Sister showed up....you are correct regarding the old appendix, my poor sister had to have hers removed..
As I lived across the road from Jock the Barber's in Clyde Street, my sister Janette used to dare me to roll up my pyjama legs, put on my coat, creep downstairs, cross the road to the shop for a penny strip of Everlasting Toffee!!! Happy days indeed Anne, and yes, the Dentist was a very busy man with us all. Bill and Harry, we all have memories of that one!